Missouri motorcycle accidents are responsible for 10 percent of vehicle-related accidents and injuries, according to reports. Victims in a Missouri motorcycle crash may face high medical bills, time off work and loss of future wages as they recover from their Missouri motorcycle accident. Motorcycles are often involved in accidents because they are smaller and may be more difficult to see, putting motorcyclists at risk of serious injury. 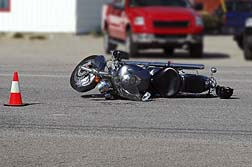 Send your Missouri Motorcycle Accident claim to a lawyer who will review your claim at NO COST or obligation. According to the National Highway Traffic Safety Administration (NHTSA) in 2007, 5,154 motorcyclists were killed and 103,000 were injured in the US. Eighty-four motorcycle fatalities occurred in Missouri. The Missouri Department of Transportation reports 85 deaths in motorcycle accidents in 2009. The Department of Transportation notes 99 percent of people who died in accidents involving motorcycles were the motorcyclist. Furthermore, 10 percent of Missouri traffic fatalities involved a motorcycle and half of motorcycle accidents involved another vehicle. A 2004 study conducted in Europe found half of motorcycle accidents are caused by a primary error on the part of the driver of another vehicle, not the motorcyclist. The study, called "In Depth Study of Motorcycle Accidents," found 65 percent of the accidents involved failure on the part of the other driver to see the motorcycle. Thirty-seven percent of accidents studied were the result of error on the part of the motorcyclist. By law, Missouri motorcycle riders must wear helmets regardless of their age. The Missouri helmet law covers all low-power cycles with an engine displacement of greater than 50cc, brake horsepower greater than 3 or that are capable of attaining speeds greater than 30 mph, according to the Insurance Institute for Highway Safety. 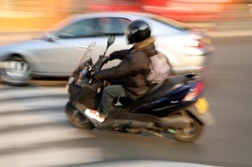 Negligence in motorcycle accidents takes a variety of forms. These include failure to stop at a light or stop sign, failure to yield to another vehicle, failure to yield to a pedestrian and driving while distracted (including talking on a cell phone). 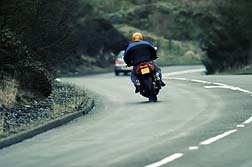 Other drivers on the road may be negligent if they fail to notice an approaching motorcycle or if they misjudge the motorcycle's distance or speed. Missouri uses the principle of pure comparative negligence when determining accident liability. This means that in the case of an accident, the injured party can recover damages for his injury even if he was 99 percent at fault for the accident. In this situation, however, the victim's awarded damages are reduced by the amount of fault he is responsible for. For example, if the injured party is 50 percent responsible for the accident, his award will be reduced by 50 percent. Defective motorcycle parts can play a role in serious motorcycle accidents and can result in harm to the motorcycle's riders or other people on the road. Issues with motorcycles include faulty brakes, engine problems, tire blowouts and steering problems. In Missouri, it is illegal for drivers to drive with a blood alcohol concentration (BAC) of.08 or higher. In Missouri, Driving Under the Influence (DUI) is the same as Driving While Intoxicated (DWI). The DWI includes alcohol and/or drugs. It is illegal for drivers in Missouri to operate a vehicle with any amount of a controlled substance (such as marijuana or cocaine) in the blood.